This month, we’re doing something a little different. We’re doing to have two self published Saturdays! Why? Because I thought the 31st was a Saturday. Nope, it’s a Friday, so the last Saturday this month is today. All this to say I’m reviewing TWO self published books! One today, and one next S aturday. Just like this book, my review will be short and sweet. Another book we’re not used to reviewing on Readcommendations, but I enjoyed it so much I feel like I need to share it with you. It’s a small, cute, illustrated advice book on the value of friendship and the methods of keeping a friend close and valued. It’s one of those books you may get a friend as a gift, to remind them how much you love them; or a book you may hang on to yourself, to reming you of how you can show your friend they mean so much to you. Honestly, when I read it, I instantly thought of it as a book for adults, while it was only after that I saw it as something children would love too. It’s incredibly sweet, with such advice as “Listen: don’t just hear the words, but their meaning and emotion” or even “Share the Same Melody”, things that seem obvious, but as human beings, we frequently tend to forget to do. It’s so very nice to have a little handy guide to put us back on track. Reading it filled me with the “warm fuzzies” and made me want to hug my besties closer. Truth is, we’re losing touch these days, relying too heavily on our social media without knowing how to act outside of it. This handy guide will guide you right back on track. I loved the illustrations. They were, just like the book, incredibly sweet. The style reminds me a lot of the Japanese chibi (“cute” cartoons) though gently painted like a water color. They’re not in your face, they’re just bringing the advice to life, one smile at a time. It’s what gives this little gem its charm: they connect with you. They looked ready to hop out of the page and hug me. 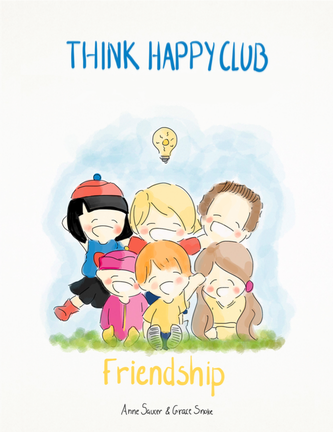 Friendship is the first of these little guides in the series, the Think Happy Club, and I would love to read more. I wonder which one they’ll think of next! It’s great for kids and adults alike, and does exactly what it sets out to do – it’s “filled with inspiration images focused on improving or changing things in our lives” and promoting healthy relationships. We all need a little of that in our lives. Check it out on Amazon and the Think Happy Club website. Reblogged this on Mary-Margaret Network.